In January 2003, while we were in Zanzibar to camera-trap carnivores in Jozani-Chwaka Bay National Park, my husband Jon Winther-Hansen observed a Zanzibar Sykes’ monkey (Cercopithecus mitis albogularis, a.k.a. Blue monkey or White-throated guenon) eating a sloughed-off snake skin. 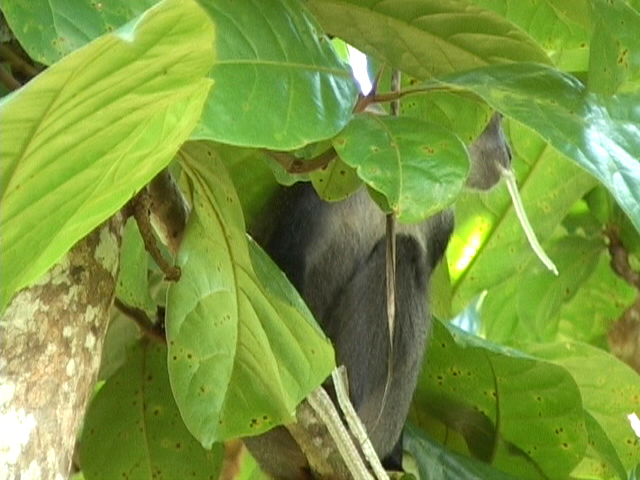 Partly hidden by the lush foliage of the Indian almond tree (Terminalia catappa) in which it was sitting, the monkey completely consumed its prize in about five minutes. This took place near the Jozani Visitor Centre. Inhabiting forested parts of east, central and southern Africa, Sykes’ monkeys are food generalists, eating leaves, fruits, seeds, flowers and invertebrates and occasionally preying on vertebrates (Rudran 1978; Butyinski 1982); conspecific infants have also been observed being killed and eaten (Fairgreave 1995). The Zanzibar Sykes' monkey is the subspecies found on Unguja island and on the mainland opposite the Zanzibar archipelago. We don't know what kind of skin the monkey's meal once belonged to. More than 20 species of snake have been recorded on Unguja (Pakenham 1983: 5; Spawls et al. 2002: passim), but stills from our video clip, some of which are reproduced here, do not permit certain identification of the translucent skin. While the literature contains a few reports of nonhuman primates dispatching and even consuming snakes (see references in Headland & Greene 2011), we are not aware of reports of Sykes’ monkeys or other primates eating the sloughs snakes leave behind when they shed. We would welcome further information on this point. Butynski, T. M. 1982. 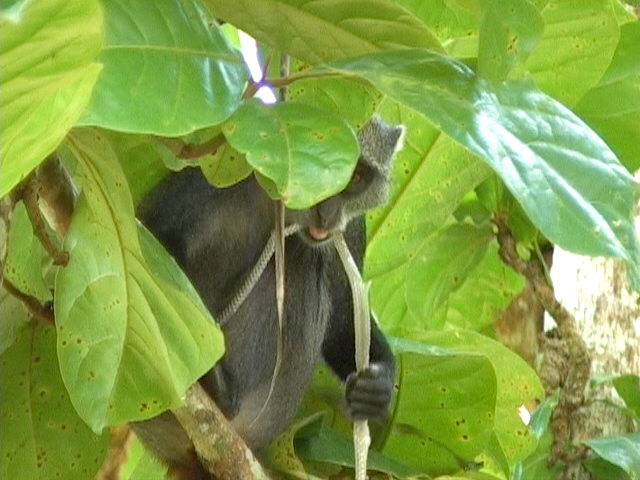 Blue monkey (Cercopithecus mitis stuhlmanni) predation on galagos. Primates 23, 563-566. Fairgrieve, C. 1995. Infanticide and infant eating in the Blue monkey (Cercopithecus mitis stuhlmanni) in the Budongo Forest Reserve, Uganda. Folia Primatologica 64, 69-72. Headland, T. N. & H. W. Greene 2011. Hunter-gatherers and other primates as prey, predators, and competitors of snakes. Proceedings of the National Academy of Sciences 108, E1470-E1474. Pakenham, R. H. W. 1983. The reptiles and amphibians of Zanzibar and Pemba islands (with a note on the freshwater fishes). Journal of the East Africa Natural History Society and National Museum 177: 1-40. Rudran, R. 1978. Socioecology of the Blue monkeys (Cercopithecus mitis stuhlmanni) of the Kibale Forest, Uganda. Smithsonian Contributions to Zoology 249. Spawls S., K. Howell, R. Drewes & J. Ashe 2002. A Field Guide to the Reptiles of East Africa: Kenya, Tanzania, Uganda, Rwanda and Burundi. London & San Diego: Academic Press.